As promised, today we’re talking about teapots. Much has already been written on the subject. In fact, a quick Amazon search turns up books on making teapots, collecting teapots, anthologies of teapots, artful teapots, history of teapots, pricing guides, expert guides, British teapots, Chinese teapots, Japanese teapots and so forth. Rather than assume we have some new insight to add on this vast subject, you will find below a short collection of our observations on teapots of the European ceramic variety – Asian ceramic teapots we’ll save for another time. Ceramic Teapots: We particularly enjoy ceramic teapots, such as Brown Betty types, for everyday use. These teapots come in a variety of color schemes, decorations and shapes, generally less fancy and more whimsical thereby adding a light note to the day as your daily tea time should. They are relatively inexpensive & hold the heat decently well, even better with a tea cozie. 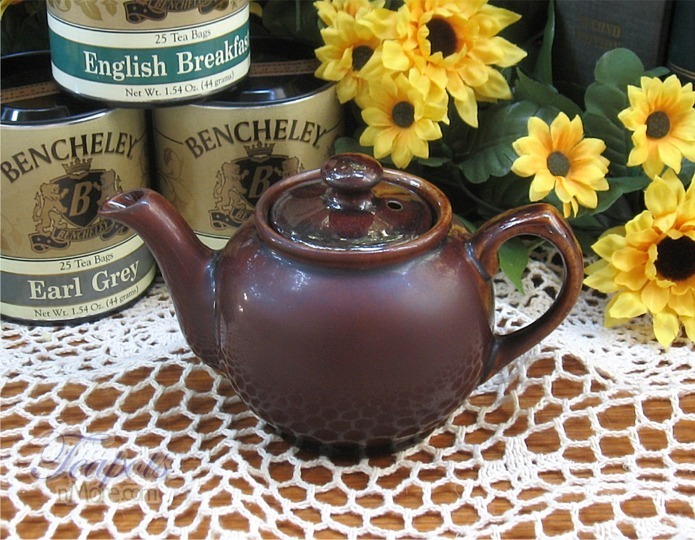 Brown Bettys have the added benefit of being in continuous supply due to their popularity and, therefore, should one break we won’t cry over a broken teapot. Teapot collectors will find a large selection of fanciful shapes in this type of teapot and many miniatures are available as well. Porcelain China Teapots: We like these teapots for their versatility and pricing when looking for a nicer teapot on a budget. There is a large variety of shapes and patterns available from numerous manufacturers and countries. 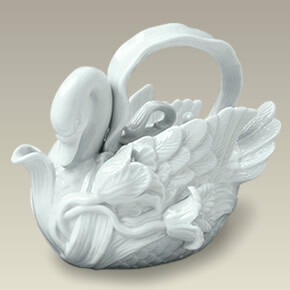 Our favorite manufacturers are Lomonosov Imperial Porcelain and Maryland China. There are a large number of highly artistic teapots and, as with ceramic, many unique shapes and miniatures crafted in porcelain. On a side note, we’ve noticed, in a side by side comparison, that the same pattern on porcelain and bone china will have small, but noticeable differences. The colors in the pattern decal will be brighter and the lines more crisp on porcelain while the bone china presents a softer, more muted overall look. Additionally, bone china is generally whiter than porcelain. When putting together a tea set of the same pattern, we recommend that you do not mix porcelain and bone china pieces. However, if you are putting together an eclectic tea set (mismatched patterns), we see no problem. Bone China Teapots: Ah…our favorite for elegant tea times! Bone china teapots are available from a number of manufacturers and countries in a variety of patterns and shapes, both traditional and modern. The addition of bone ash makes this china whiter and stronger than porcelain, also providing its name. These teapots are generally thinner walled and more delicate. Consequentially, they don’t hold the heat as well and, for this reason, tea cozies are a good investment. They generally cost more than porcelain or ceramic and the prices vary widely from company to company. We’ve observed that bone china teapots coming from England can command higher prices, but even in this category the prices vary widely. Some English bone china manufacturers outsource the making of the bone china to other countries and finish the product in England. We believe this is the reason for the wide price range from company to company. Our favorite English bone china company is Heirloom Bone China. This company has all their bone china manufactured and decorated in Staffordshire, England, using 50% bone ash for superior quality. Good care is required with any ceramic/china teapot, but especially bone china. We recommend hand wash only to maintain the finish and any gold decoration as dishwasher action and detergent are too strong. This is a good recommendation for any ceramic teapot as you don’t want a build up of detergent residue in the teapot body or spout. It doesn’t make for tasty tea! A Final Observation: If you are brewing different types of tea in the same teapot, we recommend teapots that are fully glazed inside. Unglazed teapots can absorb the odor and flavor of the tea brewed. Hence, you wouldn’t want to brew a citrusy Earl Grey or smoky Lapsang Souchong and then a delicate Jasmine Green tea in the same unglazed teapot. The Jasmine tea just wouldn’t taste right. In fact, nothing would taste right after the Lapsang Souchong! Well, hopefully we’ve entertained you and imparted some useful information. Please share your questions or comments. We love to hear from you! 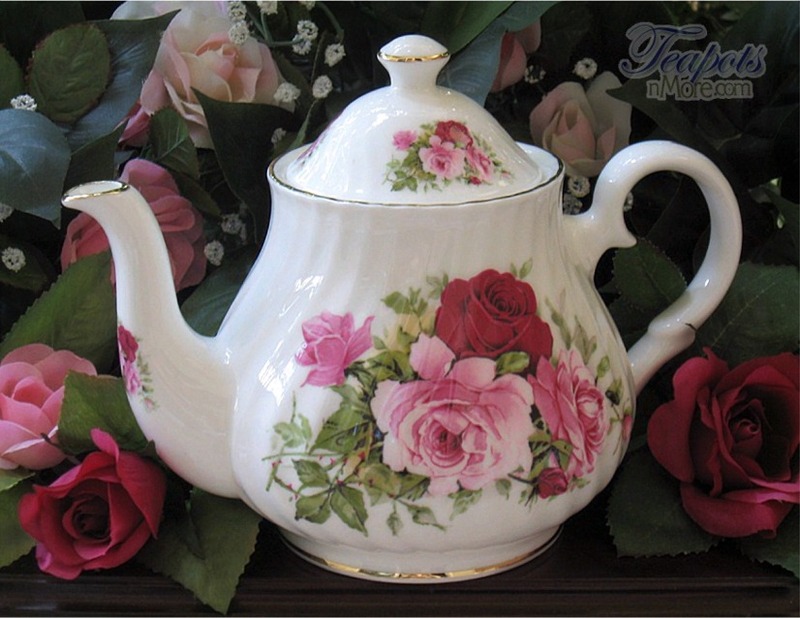 As always, we invite you to visit Teapots ‘n More and browse our current selection of english bone china teapots, porcelain teapots, tea accessories, tea cups, tea miniatures and bone china tea sets. This entry was posted in Gift Ideas, tea sets, teapots and tagged ceramic teapots, english bone china, porcelain teapots, tea sets, tea tips, teapots, Tips for Tea Parties. Bookmark the permalink.